Every region of France has its own particular cheeses. Back in the time of General de Gaulle, France had 246 cheeses - and it has quite a few more than that now, given the large number of new products, inventions or copies of traditional cheeses, that have emerged from France's hundreds of dairy companies in the past 20 years. This guide is not by any means a comprehensive listing of all the products that France can offer to deck a well-garnished cheese-board. It is a look at some of the most common, and the most tasty. - blue cheeses to which can be added a number of hybrids or very individual cheeses. A further distinction is also possible: traditional regional cheeses with an "appellation d'origine protégée" (AOP) label (there are about 40 of these), traditional cheeses without an AOP label, and modern dairy-designed and produced cheeses. A very tasty uncooked pressed cheese from the Auvergne mountains, Cantal is a cheese that many consider to be quite close to an English farmhouse cheddar or chester. A lot of this "AOP" cheese is made on farms, but obviously local dairies in the region also produce it in large quantities. This delicious French cousin of the swiss "Gruyère" cheese is an appellation protégée cheese from the Franche Comté region of eastern France. The production area stretches along the Swiss border, and all milk comes from cows grazing at at least 400 metres altitude. This cooked cheese is manufactured collectively village by village, and the production method has changed little over hundreds of years. Comté cheese generally comes without holes in it; but sometimes it may have small holes. Like Cantal, Comté comes in different varieties, sometimes called "fruité" or "salé" (fruity or salty). Fruité Comté is often more elastic; salé is usually a little more brittle. The most expensive Comté is "Comté vieux" (old Comté), which is generally aged over six months and possibly over a year. Comté is the traditional cheese used in a cheese "fondue", and also for "raclette" (see below). Comté that is produced using milk not coming from cows grazing according to the "appellation contrôlée" rules, can be used to make French Gruyère. Although Gruyère is the name of a Swiss village, it has recently been given an IGP label (= PGI - Protected Geographical Indication) in France. Gruyère is an AOP in Switzerland. Cheeses similar to comté are Beaufort, and Abondance made in a similar manner in the French alps. Beaufort tends to be stronger tasting than Comté, and the taste is also slightly different. Emmental is your traditional cheese with holes in it. It is not an appellation contrôlée cheese, and is thus produced over a large area of France, notably in the east. It lacks the finesse of Comté, and is generally produced industrially, though industrial producers have their own label of quality for this cheese. French Emmental benefits from an IGP label. This slightly-cooked hard cheese is produced, obviously, in the Pyrenees - though it does not benefit from an appellation contrôlée label. Pyrenees comes with a distinctive black skin. Generally speaking it is a fairly bland cheese that will appeal to those who do not like strong-tasting cheeses. An IGP cheese. 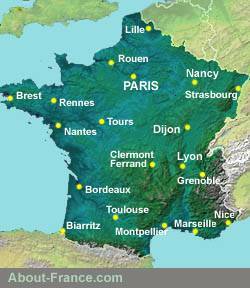 There are literally hundreds of soft French cheeses; each region has its own specialities. Many of these - notably those with appellation contrôlée - are manufactured in small units, and (with notable exceptions such as Brie and St. Nectaire) if you want to buy one, you must buy a whole cheese. There are two sorts of Brie, Brie de Meaux and Brie de Melun, both appellation contrôlée (AOC) cheeses named after two nearby towns in the the country some fifty miles south east of Paris. Brie comes as a thin round cheese about 20 inches in diameter, with a soft white crust. This crust is eaten, not cut off! Brie is a very mild creamy cheese that should appeal to anyone who does not enjoy strong tasting cheese. A fairly strong "rind-washed" soft cheese from the Burgundy region. Thicker than a Camembert, Epoisses, like other rind washed cheeses, is yellowish on the outside, and white on the inside. The white centre is often almost crumbly, while the cheese under the skin remains very soft. Epoisses has a distinctive taste, shared with a similar cheese from a bit further north "Langres"; both of these cheeses are appellation contrôlée cheeses, and are admirable accompaniments for red wine. Another cheese in the same family is Maroilles, made in the north of France. A semi-soft cheese from Auvergne, made with cows milk, and flavoured with pepper and garlic. A small hemispherical cheese weighing about half a pound. Unfortunately, Mont d'Or is a seasonal cheese and is not manufactured in the summer months because the milk quality in the regin is different when the cows have rich summer pastures to graze on. A fairly strong rind-washed soft cheese from the Vosges mountains in Eastern France, in the Lorraine region. Munster is definitely not a cheese for those who do not like strong tasting varieties. It comes in two varieties, normal and "au cumin" (with cumin seed). Darker on the outside than Langres or Epoisses, Munster generally has a thicker rind which some eat, others cut off. Even an unripe Munster is tasty; a ripe one - which may well be quite hard on the inside - will be very strong. However, like other strong cheeses, Munster should never have an acrid taste. If it does, it is over-ripe. Some claim that this is the greatest of French cheeses - and possibly this could be true for an exceptionally good cheese; but Saint Nectaire - an appellation contrôlée cheese from the mountains of the Auvergne - is, alas, a cheese that varies considerably in quality and taste. To start with there are two distinct types, the farm variety and the dairy variety. The farm variety is generally better and more expensive, the dairy variety, usually found in supermarkets, is frequently sold too young. When this cheese is young, it is quite dry and hard; a properly matured Saint Nectaire should be soft and elastic, with a slight tendency to flow if left at room temperature. One does not eat the rind of a Saint Nectaire. A cheese very similar to Saint Nectaire - notably to the variety found in supermarkets - is Savaron, a non-appellation cheese that is also produced in the Auvergne but generally by industrial dairies. Bleu d'Auvergne - An appellation contrôlée cheese whose quality and taste can vary considerably , going from the bland to the sharp. Even in a supermarket, you can ask to taste before you buy. Specific varieties of Bleu d'Auvergne include the ancient Bleu de Laqueille . Roquefort - The most famous French blue cheese, though not necessarily the best. Roquefort is an Appellation contrôlée cheese, made from the milk of one single breed of sheep, the "Lacaune" breed. The cheese has been made since the Middle Ages, and has been famous for many centuries; more recently it has been the object of intense and successful marketing. Over 18,000 tons of Roquefort are manufactured each year, and the cheese is exported worldwide. Made in the "causses" mountains of southern France, in the department of the Aveyron, and matured in caves. In the past, a lot of the milk used in the making of Roquefort is imported into the region; but the cheese's success has led to a development of sheep rearing in the Aveyron, and all the milk used in Roquefort is now sourced locally. Boursin (a cream cheese with herbs and garlic). The words "tomme" and "fourme" are generic words that can describe several different types of French cheese. Etymologically, the French word for cheese, "fromage" is a diminutive of the word "fourme". Red wines go best with most cheeses, though with some very strong cheeses it is better to choose a light-bodied red wine. Dry white wines also go well with cheese, especially with tasty but mild cheeses. But in the end, it has to be a matter of individual choice. Your idea of what goes well together is just as good as the next man's - even if the next man claims to be an expert. Remember the adage: "Even if all the experts agree, they may still be wrong." It's your taste against his. In one of his memorable witticisms, General de Gaulle once quipped "How can you govern a country that has 246 varieties of cheese?" What he meant by that was not quite clear - whether he was commenting on France or on French cheese; yet this remark has gone down in history among de Gaulle's most memorable quotations. What he probably meant was that France as a country is as diverse as its cheeses - or vice-versa. And just as France is physically the most varied country in Europe, so its cheeses reflect this wide and rich cultural diversity. About-France.com helps you to distinguish your Bries from your Pyrenees. Since 1997, FROMAGES.COM has been offering cheese fans a selection of traditional French cheese. Cheese sent worldwide by express delivery. Here are ten great French cheeses, including the most popular cheeses with French consumers. These are cheeses that can be bought from cheese merchants and supermarkets throughout France, and are also exported. Many other superb cheeses are hard to find outside their region, except from well-stocked specialist outlets, and have not been included in the selection.